The two biggest names in online house hunting -- Zillow and Trulia -- may be teaming up, a pairing that is making some real estate brokers nervous. The rumored deal -- the companies won't confirm it -- sent the companies' stocks soaring Friday as the chatter gathered steam. The companies don't charge for publishing these listings of homes for sale, but they do charge real estate agents fees to appear on their listing pages. Should the two sites merge, they could have the leverage to charge more, said Steve Murray, editor at Real Trends a real estate communications and consulting company. Already, some agent teams spend $20,000 a month with Zillow, Trulia, or both, said Murray. For now, the agents are generally satisfied with the fees because the exposure generates so much business. 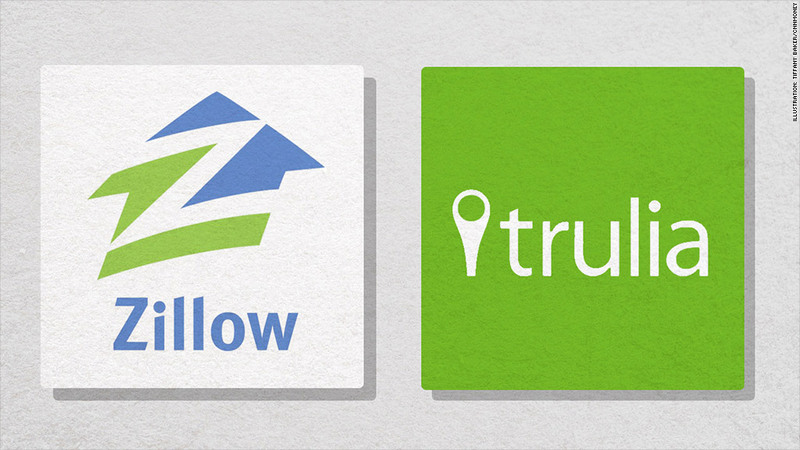 Zillow and Trulia together attract 130 million visitors a month. "Combined, [Zillow and Trulia] could further erode the leadership of the National Association of Realtors," said Jonathan Miller, president of Miller Samuel, a New York based appraisal firm.